Unique to each project, columns are a perfect way to enhance the look and value of one’s home. Columns have many uses, depending on the project’s needs. Ranging in height and material, there is a column that will perfectly suit your next home improvement venture. Recently, one of our customers from Lago Vista, Texas named Rita shared her excellent project pictures with us. Impressive in size, Rita’s home uses the open space beautifully with our sturdy Turncraft Endura-Stone columns. 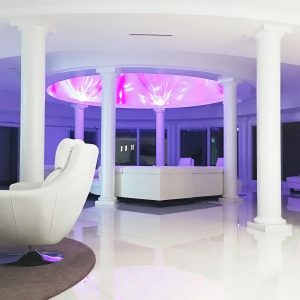 This project is unique because it shows that large columns are for the interior of the home too! The set up of the columns create a regal look to the living room. The Turncraft Endura-Stone columns are historically inspired and load bearing. Constructed from fiberglass reinforced polymer (FRP) material, the columns are perfect for interior or exterior applications. Additionally, the FRP material is impervious to insects, rotting and moisture. Another great quality of this column is that it is ready to paint when it arrives to the customer. Customers can either leave the column in its original white finish or paint it the color of their choosing. Feel free to check out the collection of architectural columns via the link below!